The public consultation period for the Draft Methodology for the 2018 Access to Seeds Index has ended. Thanks to those who contributed. 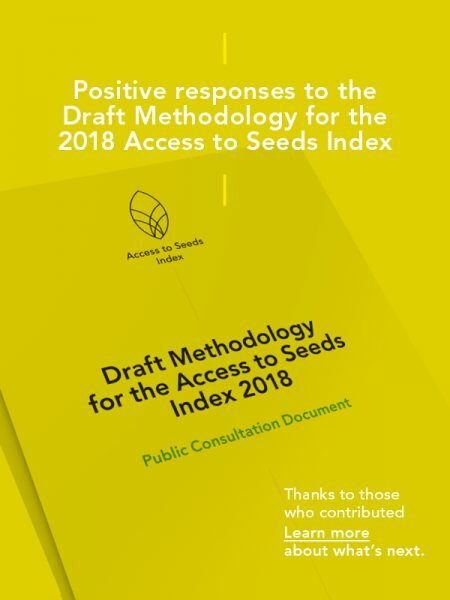 Stakeholders were invited to provide their feedback on the Draft Methodology for the 2018 Access to Seeds Index until 19 October 2017. (Cliquez ici pour la version française). The public consultation is part of a two-year review and consultation process that started with the release of the first index in February 2016. Regional and global expert review committees (ERCs) also provided a final round of feedback for the report. Expert meetings to review the methodology were organized in Abidjan and Johannesburg simultaneous to the public consultation period. Following this, expert meetings also took place in Hyderabad and Amsterdam. Feedback from the ERCs was used to update the draft methodology, which was subsequently approved by the Supervisory Board on December 6. The methodology for the 2018 Access to Seeds Index will be launched in the beginning of 2018. The data collection for the 2018 Access to Seeds Index will start in the beginning of 2018. Companies selected for the assessment will be informed about the data collection process in late 2017. Companies will receive a questionnaire to submit data in a carefully managed process that ensures equal treatment of each company. To facilitate the data collection process, a user-friendly online data collection platform is being developed. The analysis of the data both on a company-level and an industry-level is overseen by the Access to Seeds Foundation’s lead researchers. For verification purposes, analysts carry out an extensive quantitative and qualitative check of each indicator for each company. Scoring is carried out following scoring guidelines approved by the Foundation’s Supervisory Board. For specific areas, technical experts are requested to review the analysis. Everyone involved in the data collection process has signed a confidentiality agreement. The release of the 2018 Index is scheduled for the period November 2018 – February 2019. The indexes for Asia and Africa, as well as the assessment of globally operating companies, will be released at separate moments during this period.